Nissan has introduced a new top of the range Juke - the Shiro. The new model replaces the Kuro, which is Japanese for black, so you won't be surprised to find out that Shiro means white. 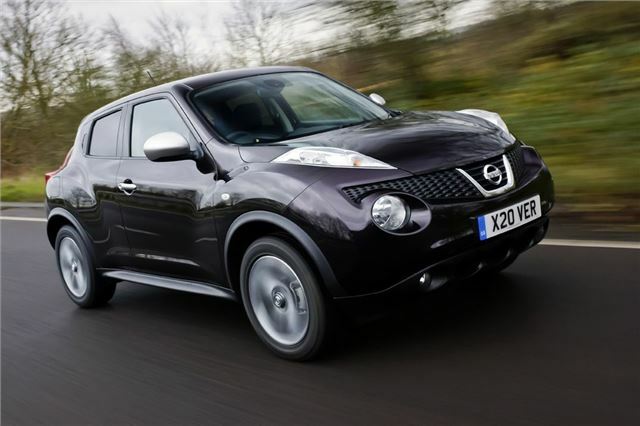 Despite the name it's actually available in all the usual Juke colours as well as a new colour called Nightshade. Prices start at £17,695. Inside it has a host of white details, so you know it's a Shiro, which Nissan describes as 'tasteful'. The odd centre console, which was inspired by a motorbike fuel tank, is finished in white as are the door panels and the bits around the electric window switches. There's also white stitching on the leather steering wheel, gear lever surround and on the edges of the leather seats. The seats also have a double layer fabric with a white background visible through the perforated leather. If that wasn't enough there's also a leather covered centre armrest, with - you guessed it - white stitching plus illuminated chrome-plated door sills. On the outside the Shiro gets dark grey 17-inch alloys, satin silver door handles and mirrors. The Shiro is based on the Tekna trim and is available with three engines - a 110PS 1.5-litre dCi and a 117PS 1.6-litre petrol along with the turbocharged 1.6-litre DIG-T with 190PS. A 4x4 version and CVT automatics are also available. Deliveries are due to start in March.